Kare-N-Liver is exclusively formulated from Schisandra chinensis and Acanthopanax senticosus, a natural berry & natural root. This combination is recognized today as the strongest anti-oxidant known to modern science. Taken daily each morning and felt within hours, Kare-N-Liver increases the body's oxygen supply in the heart, circulatory system, liver & endocrinal glands. More powerful than vitamin E, Kare-N-Liver fights free radicals, the metabolic toxins & poisons produced by your body as a reaction to stress. By arming your cells with more oxygen, Kare-N-Liver helps your body counteract mental & physical fatigue. More important, you build up a reservoir of protection from stress itself. The result: greater performance & well-being. 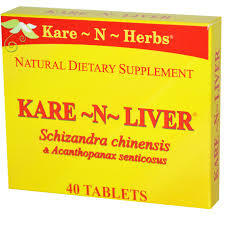 Kare-N-Liver provides a support system for the Liver. These water-soluble tablets help the liver recharge it's tired cells and their subunits. This leads to a rapid regeneration of the liver tissue. Recent studies show that the active ingredient, Schizandra, protects the liver against chemical toxins and poisons. From studies carried out in China, and more recently confirmed by American research, Schizandra is the most efficacious liver protective substance known! We are continually submitting our Liver to undue stress and over work, with alcohol, fats, etc., that form part of our daily diet. We demand that our Liver work overtime, doing two full time jobs 24 hours a day. The Liver only complains when it is already too late. The Liver does not cause us pain until the damage is done. When overeating and alcohol impair the liver's functioning, its cells begin to degenerate and are invaded by fats. To help protect your Liver, you may want to eat foods with no toxins, moderate your intake of alcohol, and take a daily liver cleanser. Kare-N-Liver is a liver cleanser and antioxidant you can trust. All of our extracts are properly standardized, with a healthy dosage of active ingredient per tablet. They are all Fast Acting, Normalizing and Non Toxic, with no side effects. A study was made on 500 patients with chronic hepatitis. Today there is no known synthetic drug in existence that cures this disease. However, given an extract of Schizandra, found in Kare-N-Herbs, 85% of the patients showed a normalization of the liver function and relief of other symptoms. This is said to be remarkable! Suggested Use: Take 1 tablet 1-4 times daily or as recommended by your healthcare practitioner. take with your healthcare providers.